This is a scalable context timeline. It contains events related to the event January-July 2003: Bush Administration Delays Release of 9/11 Congressional Inquiry Report until after Start of Iraq War. You can narrow or broaden the context of this timeline by adjusting the zoom level. The lower the scale, the more relevant the items on average will be, while the higher the scale, the less relevant the items, on average, will be. December 8, 2002: Bush adviser Richard Perle continues to push the story, stating, “To the best of my knowledge that meeting took place.” [CBS News, 9/5/2002] He says this despite the fact that in October 2002, Czech officials told Perle in person that the meeting did not take place (see October 20, 2002). July 25, 2003: The 9/11 Congressional Inquiry makes public its conclusion that the meeting never took place (see January-July 2003). July 12, 2004: The 9/11 Commission publicly concludes the meeting never took place (see July 12, 2004). March 29, 2006: Cheney says of the meeting: “And that reporting waxed and waned where the degree of confidence in it, and so forth, has been pretty well knocked down now at this stage, that that meeting ever took place” (see March 29, 2006). Ahmed Khalil Ibrahim Samir al-Ani, an Iraqi intelligence agent, was captured by US forces in Iraq at some point after the invasion of Iraq in 2003. His arrest was not announced and he was put in a secret CIA prison. It is unknown when he was arrested exactly, but in June 2004, the FBI is allowed to interrogate him. Al-Ani gained notoriety after 9/11 when Bush administration officials claimed he had a meeting with 9/11 hijacker Mohamed Atta in Prague, in the Czech Republic (see April 8, 2001). He tells the FBI that he never saw or heard of Atta until Atta’s face appeared in the news shortly after 9/11. [US Senate and Intelligence Committee, 9/8/2006, pp. 100 ] The allegations that the meeting took place have been slowly dying despite the efforts of some Bush administration officials to promote them (see September 18, 2001-April 2007). Also in June 2004, the 9/11 Commission publicly asserts that the alleged meeting never took place (see June 16, 2004). Nonetheless, al-Ani is kept in a secret CIA prison until 2006 and then quietly released (see 2006). 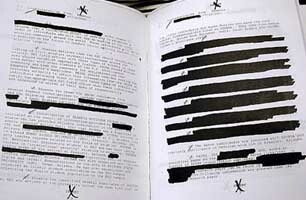 His denials are kept secret until September 2006 (see September 8-10, 2006). A staff statement by the 9/11 Commission concludes that the alleged meeting between hijacker Mohamed Atta and an Iraqi agent in Prague never happened. It claims cell phone records and other records show Atta never left Florida during the time in question. [9/11 Commission, 6/16/2004] The same claim is made in the 9/11 Commission’s final report one month later (see July 12, 2004). 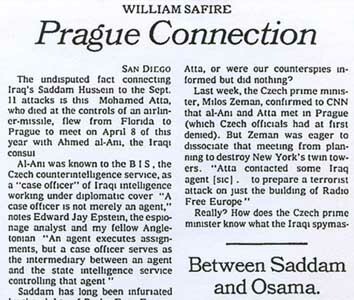 In an interview, Vice President Cheney says, “We had one report early on from another intelligence service that suggested that the lead hijacker, Mohamed Atta, had met with Iraqi intelligence officials in Prague, Czechoslovakia. And that reporting waxed and waned where the degree of confidence in it, and so forth, has been pretty well knocked down now at this stage, that that meeting ever took place. So we’ve never made the case, or argued the case that somehow [Saddam Hussein] was directly involved in 9/11. That evidence has never been forthcoming. But there—that’s a separate proposition from the question of whether or not there was some kind of a relationship between the Iraqi government, Iraqi intelligence services and the al-Qaeda organization.” [White House, 3/29/2006] This is a reversal for Cheney, who strongly argued that the meeting took place, even after most experts concluded that it did not (see June 17, 2004). A bipartisan Senate report concludes that “Post-war findings… confirm that no such meeting ever occurred” between Mohamed Atta and an Iraqi agent in Prague. It notes that “Post-war debriefings of [the alleged Iraqi agent, Ahmed Khalil Ibrahim Samir al-Ani,] indicate that he had never seen or heard of Atta until after September 11, 2001, when Atta’s face appeared on the news.” [US Senate and Intelligence Committee, 9/8/2006 ] But two days later Vice President Cheney is asked if the meeting ever took place and he still maintains that it could have (see September 10, 2006). Vice President Cheney appears on Meet the Press two days after a bipartisan Senate report asserts that there was no link of any sort between the Iraqi government and al-Qaeda before 9/11, except for one meeting held in 1995. Cheney claims he has not read the report yet, but he says, “whether or not there was a historic relationship between Iraq and al-Qaeda. The basis for that is probably best captured in George Tenet’s testimony before the Senate Intel Commission, an open session, where he said specifically that there was a pattern of relationship that went back at least a decade between Iraq and al-Qaeda.… [Militant leader Abu Musab] al-Zarqawi was in Baghdad after we took Afghanistan and before we went into Iraq. You had the facility up at Kermal, poisons facility, ran by Ansar al-Islam, an affiliate of al-Qaeda.… [The Iraqi government] was a state sponsor of terror. [Saddam Hussein] had a relationship with terror groups. No question about it. Nobody denies that.” [Meet the Press, 9/10/2006] In fact, the Senate report determined that although al-Zarqawi was in Baghdad, the Iraqi government tried hard to find him and catch him, and that Ansar al-Islam was in a part of Iraq outside the control of the Iraq government and the government was actively opposed to them as well. The report claims there was no meeting between hijacker Mohamed Atta and an Iraqi agent in Prague in April 2001. [US Senate and Intelligence Committee, 9/8/2006 ] But regarding that meeting, Cheney still does not deny it took place, even though it has been widely discredited. “We don’t know. I mean, we’ve never been able to, to, to link it, and the FBI and CIA have worked it aggressively. I would say, at this point, nobody has been able to confirm…” [Meet the Press, 9/10/2006] Earlier in the year, Cheney had conceded that the meeting “has been pretty well knocked down now at this stage, that that meeting ever took place” (see March 29, 2006).